When buying a used rifle, the very first thing most people do is look through the bore. A great looking bore is considered to be a necessary, albeit not sufficient, precondition to accuracy. 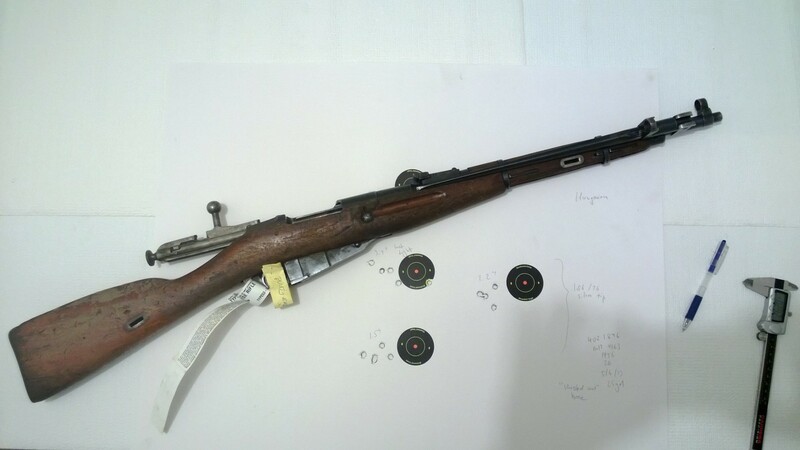 Of course accuracy is affected by great many things - ammunition, heat dissipation and thermal expansion characteristics of the barrel, the concentricity of the bore, the fit between the receiver and the stock, and, of course, ammunition. And nowhere the variability of any of these factors is a great as in military surplus rifles. These old guns were made on ancient equipment, often under wartime production pressures, sometimes using substandard materials and hasty manufacturing process. When I first started dabbling in firearms I used to think that military equipment should be of superior quality, because lives depend on its performance. I quickly discovered that, at least as far as accuracy is concerned, nothing can be further from truth. In fact, almost any modern commercial hunting rifle will outshoot most of military guns. The same is true for military surplus ammunition, especially that of former Communist block countries. 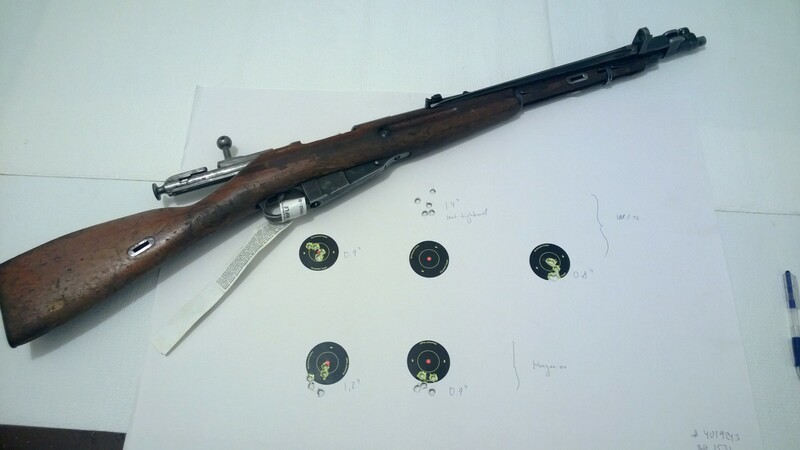 And yet most people, when buying a Mosin, first look down the barrel. A couple of weeks passed, and not one of them sold. So I decided that instead of selling them, I will test my theory that the bore condition in a military surplus rifle matters a lot less than what people think, especially when shooting crappy surplus ammunition. I took them off the shelf, and cleaned. Not too thoroughly, just as much as I would expect a regular person, without an access to a boroscope, would. 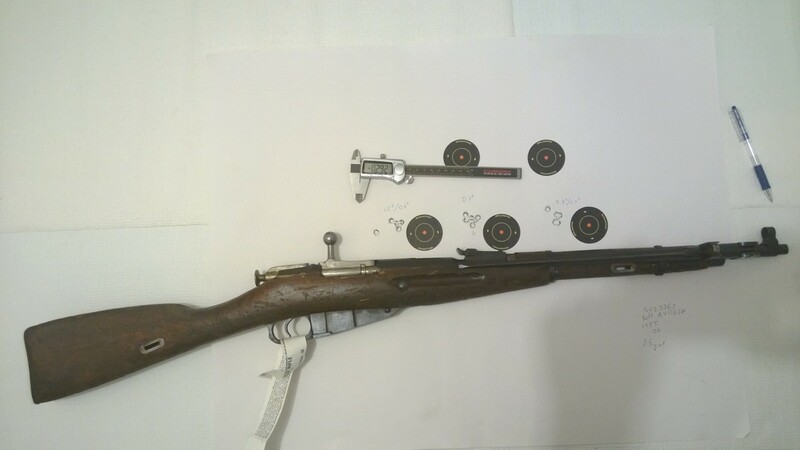 Initially, before cleaning, I classified 5 rifles as follows: 2 with new bores, one with a worn bore, one with rusty, and one with an almost smooth bore. The latter two had barrels that initially looked truly horrible. I did not expect that they were shootable at all. However, after cleaning, it turned out that the one with a "smooth" bore simply had a bunch of cosmoline packed into the grooves, that I confused with carbon fouling when looking through the boroscope. Once the barrel had a wire brush through it, most of this cosmoline came out, and the appearance of the barrel to the naked eye became indistinguishable from one that I classified as simply "worn". I then pulled a bunch of Soviet and Hungarian surplus ammunition from storage, and headed to the range. 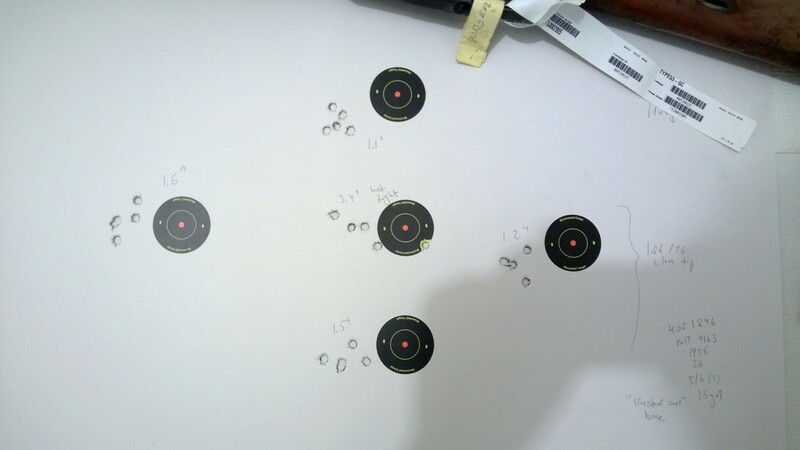 After shooting 3-5 5-shot groups from 25 yards, the results were as follows. Excluding one flier, the average group was only 0.7". With the flier, the average was 1.0". By the way, this is way better than a factory target for my Arsenal SGL-21 that I bought a few years ago for $730. And coming from a rifle that I would normally sell for about $200. 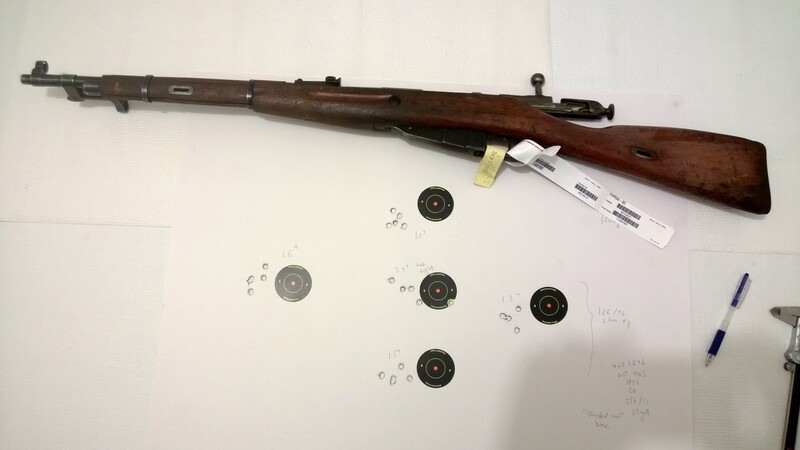 This rifle shot somewhat less tight groups, with the average of 1.0". 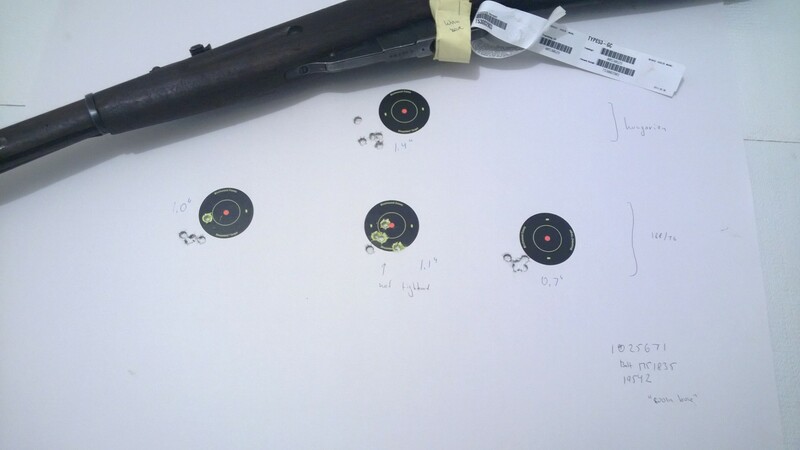 While the rifle with the "new" bore had a couple of fliers with the rest of the shots grouping extremely tight, this one mostly had a uniform dispersion. To the naked eye, the bore on this rifle looked new. When examined with the boroscope, microscopic pitting is visible, but the rifling is sharp. This rifle shot essentially the same groups as the rifle with the new bore. 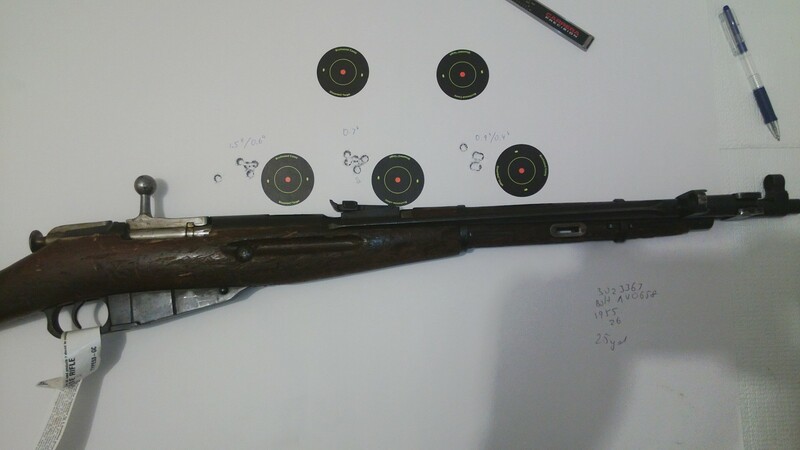 The very first group (1.1") was shot with the action being loose in the stock, because the rifle was stored with action bolts loose, and I forgot to tighten them. The new 2 shots were 1.0 and 0.7", a tight group with a flier, and a tight group. 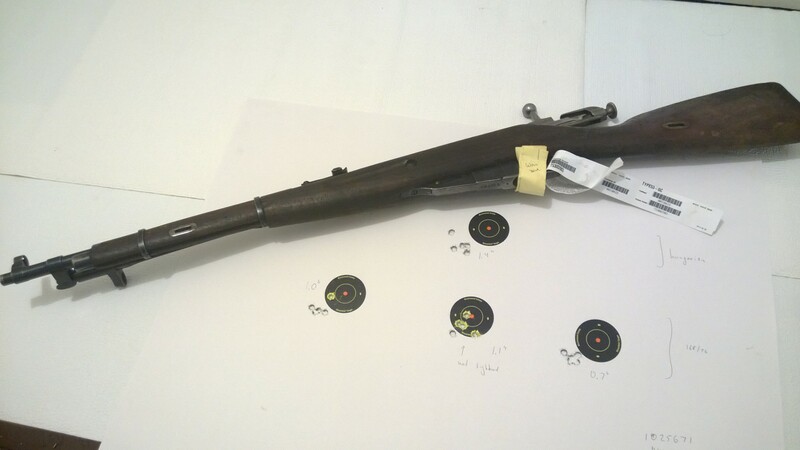 The average of the first three was 0.9, better than one for the rifle with the "new" bore. 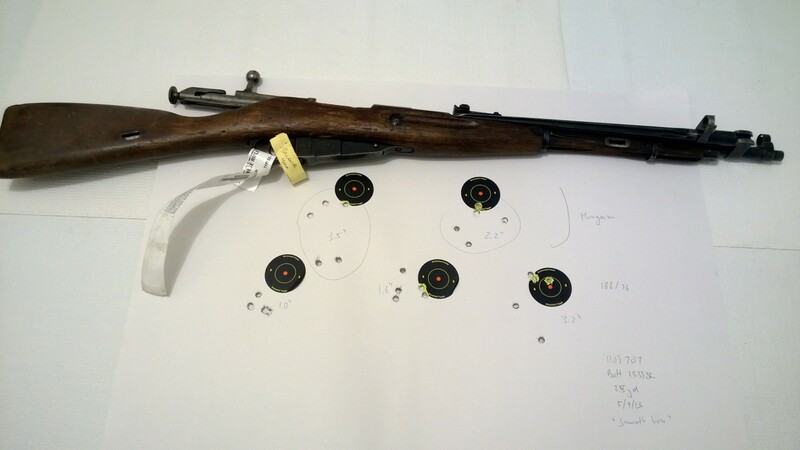 The final group was shot with Hungarian ammunition, which the rifle did not like so much. To a naked eye, this rifle had dirty groves and shiny lands. Under the boroscope you can see OK rifling and a lot of pitting. Rust was literally blooming in this one. At first sight, this and the next one was possibly the worst bore condition I have ever seen on a rifle. Ever. When it was first shot, a firestorm of sparks came out of the barrel. The first group was really bad (3.4") because, again, I forgot to tighten the action. After I did it, however, the rest of the groups were OK - 1.6, 1.5, 1.2, and 1.1, an average of 1.35". When the bore cleaned up, to the naked eye it was indistinguishable from the "worn" bore in the previous rifle. However, it looked a lot worse through the boroscope - a lot more severe pitting and worn lands. When I first looked through the barrel on this rifle, a whole segment of it looked smooth. I though it was completely worn out. But when I ran a bronze brush through it, a lot of cosmoline came out, and the rifling started to show up. After a lot of vigorous cleaning, it looked the same to the naked eye as the bore that I classified as simply "worn". But the performance at the range was atrocious. Under the boroscope it looks almost exactly identical to the "rusty" bore. That the performance is so different suggests that there is something else that is wrong with the rifle, other than the bore condition. So does the bore condition matter? Well, sort of. While the rifle with the "new" bore shot the best, the correlation broke when I tested the rifles with less than perfect bore conditions. 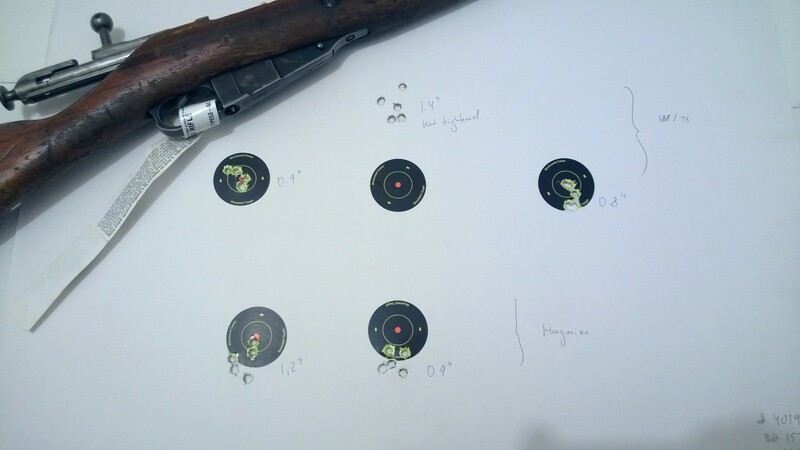 A rifle which I considered to be worn shot as well as the one that looked like new, and the two rifles with bores that were nearly identical under the boroscope had extremely different levels of accuracy. As you can also see, assessing the state of the barrel without a boroscope is very difficult. To the named eye, "worn" looked the same as "rusty" and "smooth" (after cleaning), but under the magnification of the boroscope the picture was dramatically different, and so were the results.